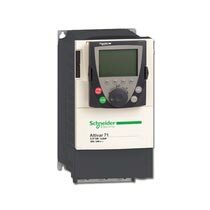 Schneider Electric is a leading designer and manufacturer of automation and control solutions. In this area, youâ��ll find an extensive range of products, from programmable relays through to high performance motion controllers and interface modules. We have the technology capable of controlling simple machines through to complex process control applications across all industrial, infrastructure and building sectors. Expandable : The simple addition of I/O, communication cards, and programmable controller cards make this drive highly adaptable and connectable to other TelemecaniqueÂ® products.